In the spirit of Halloween and Dia de los Muertos, we took a ride to the cemetery this past November. If you aren't familiar with Dia de los Muertos, it's a Mexican Holiday that honors the adults in your life that have passed. In Mexico, their graves are cleaned and decorated with bright orange marigolds. Unfortunately, my father passed away on a farm in Mexico when I was three and I grew up in the States. Still, I thought of him while we rode through Laurel Hill that day. It was a cold, beautiful day. 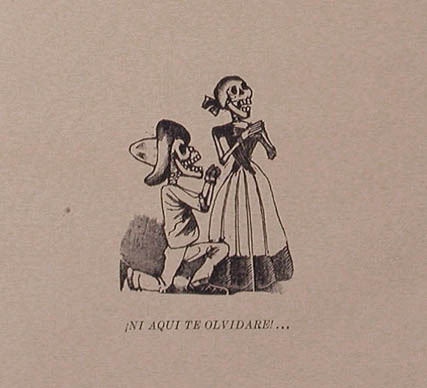 The etchings above were done by Mexican printmaker and draughtsman, Jose Guadalupe Posada.